You want your child to be well cared for while you’re at work, but daycare isn’t going to cut it: you also need to make sure your child is developing into a happy and successful person. For a quality pre-kindergarten education, check out the Little People’s Landing center in Fort Collins, CO. Our comfortable classrooms and fun, constructive activities provide the environment your child needs to grow. Our pre-k curriculum is engaging and age-appropriate, including activities such as reading, drawing, dancing, writing, singing, experimenting, and exploring. We’re sincerely dedicated to inspiring and empowering children by instilling confidence and good habits in children from a variety of backgrounds. Tasha is one of the younger members of our Little People’s Landing school management teams as she began her career with Little People’s Landing in April of 2013 as Assistant Director at our Fort Collins LPL. 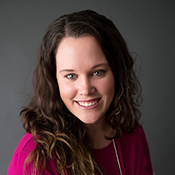 Tasha completed her degree in Early Childhood Education at University of Northern Colorado and moved successfully into the Director’s position at our Fort Collins school in August of 2013.